His Grace Bishop Mina was born on September 30th, 1952 in Cairo, Egypt. He was educated in Egypt. After finishing the military service, he immigrated to Yellowknife, Northwest Territories, Canada in the beginning of 1977. In 1978 he moved to Edmonton, Alberta, Canada and joined the University of Alberta for a degree in Accounting. In 1980 he decided to go back to Egypt to join the Monastery of Saint Mina (Mariout, Western Desert near Alexandria) and in December of the same year he was ordained a monk by the name of Fr. Paphnotius Avva Mina. In 2003 he was ordained a priest. He was called to serve as a priest in Ireland where he served for five and half years and built Saint Mina’s Coptic Orthodox Church in Cahir, Munster, Ireland. He was the last bishop to be ordained by the Thrice-Blessed His Holiness Pope Shenouda III on June 6th, 2009 as a general bishop. In April 2010, he was appointed a general bishop over the churches of Old Cairo, Manyal and Fom ElKhalig in Cairo, Egypt. 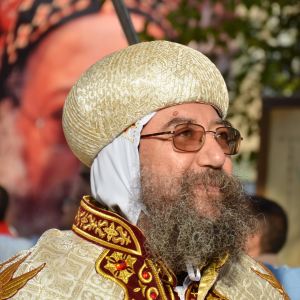 He was nominated by His Holiness Pope Shenouda III to become a bishop in Canada. On March 10th, 2013 he was officially delegated by His Holiness Pope Tawadros II as the Diocesan Bishop of Mississauga, Vancouver and all the surrounding cities, towns and villages. His Grace Bishop Mina was enthroned in Mississauga, Ontario, Canada on Sunday, April 7th, 2013 and in Vancouver, British Columbia, Canada on Sunday, April 14th, 2013. May the Lord keep the life of our honored father, His Holiness Pope Tawadros II, and his partner in the apostolic service, His Grace Bishop Mina for many peaceful years. We pray that God may confirm them on their thrones for many years and peaceful times, grant them calm and delightful times, and grant us grace and mercy through their prayers and supplications.